To put it simply, Alain Makaba is a genius of the highest kind when it comes to Soukouss guitar playing. During his decade-long tenure in the nineties as the lead guitarist in the band Wenge Musica, he transcended his art and made a name for himself as an authentic trendsetter. He has been imitated by many, but very few have come close to mastering the charm and warmth of his melodies. It's hard, in fact, to think of a more influential Soukouss guitarist from the last ten years. Wenge Musica came of age in the early nineties and immediately took over the Congolese music scene. Not everyone was impressed. Some critics complained that while the music seemed well-fitted for an all-night dance party, the lyrics lacked any substance. This new approach was in itself a bit of a revolution in Congolese music. As it turned out, it will later prove to be the new way to play the music. The "sebene", or the dancing part of the song, had become more important than the introductory ballad. Alain Makaba was at the forefront of this new approach. His eccentric guitar melodies were the cornerstone of hit albums such as Kin-e-Bouge, Kala-Yi-Boeing and Titanic. 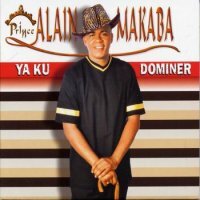 While Wenge Musica as a group reached its musical apogee with Kala-Yi-Boeing, receiving top honors all over Africa, Alain Makaba showcased the best of his craft in the album Pile ou Face released in 1995. Like Kala-Yi-Boeng, Pile ou Face has become a standard in Soukouss songwriting, a model by which other albums are measured. The album runs as a well-oiled machine from start to finish. The sebenes are full of catchy tunes and well balanced with ballads like "Inoubliable". Alain Makaba wrote, sung and performed on most of the songs in the album. Appearing as guests are such legends as Dindo Yogo and King Kester Emeneya. In his newest album, "Ya Ku Dominer" released in late 2003, he is back to his old tricks with tracks like Kisakata and Ya Ku Dominer.The album has so far received good reviews.